Washington DC - February 9th, 2015 - Robert Vecchio, President of the William Floyd Board of Education, recently joined a delegation from Suffolk County as well as representatives from more than 700 school boards and state school board association leaders from across the nation in Washington D.C., to advocate for strong public schools for all students as part of the National School Boards Association (NSBA) 2015 Advocacy Institute held February 1-3. Mr. Vecchio, along with his Suffolk County colleagues, participated in meetings with Senators Charles Schumer and Kirsten Gillibrand, as well as Representatives Peter King and William Floyd alumnus, Lee Zeldin. With the 114th Congress now in full swing, the institute came at a pivotal time for school board members to hone their advocacy skills and use them on Capitol Hill to influence the outcome of the reauthorization of the Elementary and Secondary Act (ESEA), and affect legislation to ensure maximum local flexibility and decision-making for districts. The NSBA is the leading advocate for public education and supports equity and excellence in public education through school board leadership. The NSBA represents state school boards associations and their more than 90,000 local school board members throughout the United States. Pictured Right: William Floyd Board of Education President Robert Vecchio (center) with members of the Suffolk County delegation in Washington, DC. Pictured from left to right are Edward Nitkewicz, Trustee, South Huntington School District Board of Education; Mary Louise Cohen, Trustee, Bay Shore Board of Education; Mr. Vecchio; Catherine Romano, Trustee, Islip Board of Education; John Verdone, President, Sayville Board of Education; and Fred Langstaff, Area 12 Director, Eastern Suffolk BOCES. 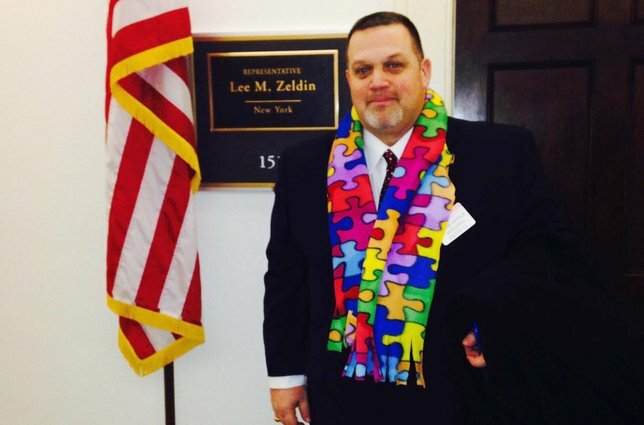 Robert Vecchio, William Floyd Board of Education President, is pictured in front of Congressman Lee Zeldin’s office in Washington DC. Subject: LongIsland.com - Your Name sent you Article details of "William Floyd Board of Education President Advocates Federal Officials in Washington DC"